Liverpool moved four points clear at the top of the Premier League thanks to a 2-0 victory away to Wolves on Friday. Mohammad Salah and Virgil Van Dijk scored the goals for Jurgen Klopp’s side who are still unbeaten after 19 games. For second placed City, they lost 3-2 at home to Crystal Palace on Saturday. Despite taking a 27th minute lead through Ilkay Gundogan, the Citizens could only look as Jeffery Schlupp, Andros Townsend and Luka Milivojevic struck to put the visitors 3-1 ahead by the 51st minute. Kevin De Bryne struck a second for Pep Guardiola’s side 5 minutes from time but Palace held-on for a famous victory, one which puts City’s title aspirations into doubt. In the battle for top 4, Chelsea where dealt a huge blow, losing their first home game of the season, 1-0 to Leicester City with Jamie Vardy scoring the winner six minutes into the second half. For Arsenal, they were 3-1 winners at home to Burnely on Saturday. League top-scorer Pierre Emerick Aubameyang helped himself to a brace while Alex Iwobi scored the third on a day that saw Ashley Barnes strike the visitors’ consolation. In Liverpool, Tottenham Hostpurs humiliated Everton 6-2 at the Goodison Park on Sunday. A brace each from Harry Kane and Son Hueng Min plus a goal each by Dele Alli and Christian Eriksen did the damage for Mauricio Pochettino’s charges who had earlier fallen behind to a Theo Wallcot opener. For Man United, they got off to the best of starts to life after Jose Mourinho, thumping Cardiff City 5-1 away from home. Marcus Rashford opened the scoring for the visitors before Ander Herrera, Anthony Martial and a brace by Jese Lingard sealed off the victory. Elsewhere, Watford, Bournemouth and Southampton also registered victories over West Ham, Brighton and Huddersfield respectively. Here are the IX players who stood-out for me in Game Week 17 (3:5:2 formation). Foster made seven saves as Watford defeated West Ham 2-0 at the London Stadium on Saturday. The ones to deny Robert Snodgrass and Michail Antonio were as good as they got in the Premier League this past weekend. RB. Ricardo Pereira (Leicester City). To go at the Bridge and win, you must have a stand-out defensive performer and for me it was Ricardo Pereira. The Portuguese made more tackles (6), clearances (11) and interceptions than any Leicester player in the Foxes 1-0 win over Chelsea at Stamford Bridge. CB. James Tomkins (Crystal Palace). Palace pulled off one of the shocks of the season, defeating City 3-2 at the Etihad on Saturday. Make no mistake about it, they may have conceded two but James Tomkins and co in defence put out a master-class all day with the Englishman standing out as he restricted Gabriel Jesus and Sergio Aguero to zero (0) shots on target. CB. Virgil Van Dijk (Liverpool). The Dutchman scored his first Premier League goal as Liverpool defeated Wolves 2-0 at Molineux on Friday. LB. Aaron Wan Bisaka (Crystal Palace). Described as arguably his finest performance in a Crystal Palace shirt by the Match of The Day panel, the young defender shone in Palace’s shock win at Man City, subduing the in-form Leroy Sane. MF. Ander Herrera (Man United). Herrera scored United’s second in their 5-1 victory over Cardiff – the Spaniard also made more tackles than any other player in the match. MF. Andros Townsend (Crystal Palace). What a strike by Townsend to make it 2-1 against City. The strike and his performance tracking back is what inspired me to include him in my team of the week for the first time this season. MF. David Brooks (AFC Bournemouth). The young Welshman has made a seamless transition to top-flight football following his arrival from Championship side Sheffield United last summer, excelling in Eddie Howe’s vibrant Bournemouth side. He scored twice on Saturday, both goals showing different sides to his quality. The first was rifled in from outside of the area, his second a lovely flicked header after ghosting into the area unmarked. The 21-year-old is a talent. FW. Jesse Lingard (Man United). 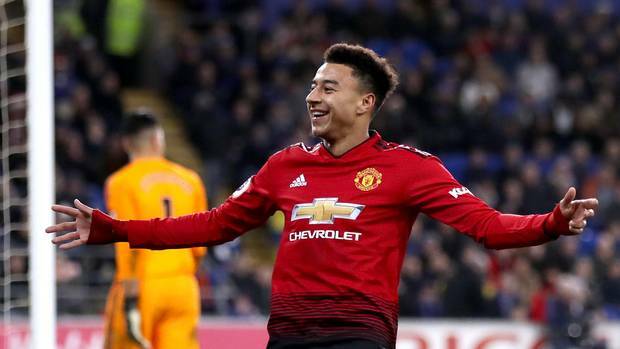 Lingard scored and assisted in a single Premier League game for just the second time, having previously done it against Watford in November 2017. FW. Son Hueing Min (Tottenham Hotspurs). Son is the man of the moment for Spurs. The South Korean bagged two against Everton on Sunday seemed involved in everything in a merciless 6-2 romp. FW. Pierre Emerick Aubameyang (Arsenal). Aubameyang scored twice in Arsenal’s 3-1 win over Burnley. The Gabonese striker has been directly involved in 19 goals in his 17 Premier League home games (14 goals, 5 assists).